My advice to you is that with time, patience, strategy and financial acuteness...you CAN do this. You CAN start become a successful entrepreneur. I had been working for other people in the construction business for over 25 years and I have learned a lot in that time that I think would make for a great business of my own. I don't mind working for others but when you think about it you are trading your time for their money, you are giving up a great amount of time and they are giving up a small amount of money. For Me, The Trade Off Between Starting A Construction Business And Working For Someone Else Was Worth It! Working for yourself in your own business the trade off is working harder and spending more time but the pay and perks of ownership are better. In my experience many companies become cookie cutter businesses after some time. Entrepreneurship is owning your own business in the basic definition but it is also being creative and coming up with new ideas and business philosophies that you believe will work. Many companies become cookie cutter businesses over time, which is to say that they get very routine and follow that routine at all costs. People like me see gaps in those routines that need to be filled and that's when new businesses are born. The first thing you need to do is research into your business idea and then set up a plan of action. In my case of starting a construction business, I am focusing on the needs of the construction customers on large construction jobs. Often times they are looking at a few million dollar renovation or a new building project but they know nothing about construction. I've found over the years that construction companies have taken advantage of this fact and used it to make even more money. Offering my services as a construction consultant for these types of projects is where I intend to build my business. Although I have experience in the construction industry starting a construction business as a construction consultant still took time, savvy, and diligence. While I have many contacts in the construction industry as well as in the public and private sector it will still meaning working very hard to get my name out there and get people to realize they need my services. Years ago I would have never thought of starting a construction business as a consultant to the industry, but after the financial downturn I realized that no company is going to look out for my financial needs and I had better begin planning to do it for myself. It can be frustrating at first but it's essential to get a good sound business plan together stating your objectives and plotting out each step from incorporating the business to office space. If you are just now thinking of starting a new business the first thing I would do is to go to the library or bookstore and get books on starting businesses and business practices related to your field. Then you can start researching what you need to do. You will also want to research what you need to do to become a company in your state. One person I would recommend reading is Donald Trump. Learning insights from him really helped to make my starting a construction business as a consultant really helped. You may not be in the finance business but he offers unique insights into the business mind. He also tells you about his habits when it comes to business. For example, you would think a man as rich as he is would take a lot of time off. He doesn't. He works just as hard now as he did 20 years ago and there is good reason for this. You need to be in a business that you love and are willing to sacrifice for, you've heard the saying " blood, sweat and tears", that's what it will take so you had better love what you are going to be doing. One habit I have gotten myself into is the work smarter not harder habit. By recognizing ways of working smarter your business will be better. This applies to everything from research to the actual work. Another habit I have started is getting up early every morning and setting work hours that I follow religiously. If you want it to work you have to work hard and the early bird does get the worm. As I have been starting this business I have learned one thing that every new entrepreneur needs to follow. Take your Time. Do your due diligence and get it right. Starting a construction business as a consultant definitely took time. It's taken me 2 years to get up and running and the first year and a half I was still working at a full time job. Do the research, get your business plan together and make sure you have what you need financially to survive as you begin your new business. I decided I would need at least 2 years income in the bank before I was comfortable starting my business full time. That money isn't for the business but for my family to make sure we have what we need while I grow the business. It's normal to have doubts, I've spent many days worrying and wondering if I can make it work. 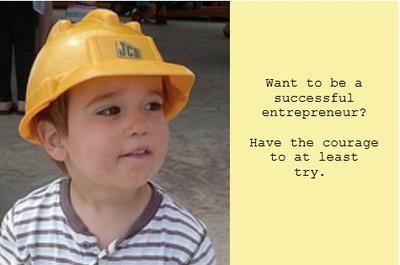 Successful entrepreneurs have the courage to at least try. If you don't try, you will never know! Working for someone else used to be reliable and stable income, it's not anymore. You are expendable and unless you start to make your own dreams happen you will always be at the mercy of someone else when it comes to a weekly paycheck.